Metalizing is a substitute for painting structural steel for decades longer than paint alone. This is a proven process, which has been used around the world for 90 years. 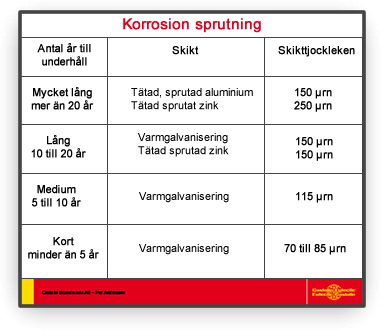 One single metalized coating protects steel for 30 to 50 years depending upon the application coating thickness and sealing. 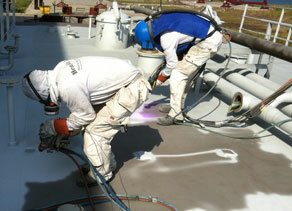 Normal paint system last for 10 to 15 years. Metallizing is considered a cold process in that the aluminum or zinc is deposited onto steel by spraying, rather than by dipping the steel into a bath of molten zinc as with galvanizing. 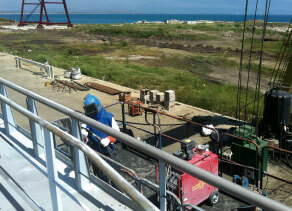 The metalizing process always begins with propes surface preparation sa 2,5. Next aluminium and zink or zink wire is melted in an elektric arc spray or gas flame spray gun. Clean compressed airstrips droplets of molten metal from the wire depositing these particles onto the steel forming the protective coating. 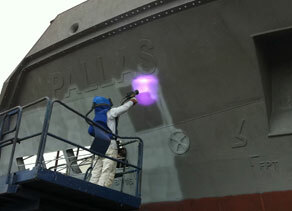 This sprayed metal coating is both a barrier coating and galvanic coating in one. The cost for metalizing varies with the project. In general an owner can expect to pay about 30 to 40 percent more for a metalized coating than for painting, but the maintenance on board during the next decades will decrease considerably.